Biography of Baroque Sculptor Noted For Statue of Saint Cecilia. The sculptor Stefano Maderno was one of the leading Italian Baroque artists in Rome before the rise of Bernini. He is credited with smoothing the transition between Mannerism and Baroque art. Sadly, very little of Maderno's sculpture survives, and his fame rests principally on a single work of Christian art - the naturalistic recumbent marble sculpture of Saint Cecilia in the Church of Santa Cecilia in Trastevere (1599-1600). The work became a classical counter-statement to the complexities of Mannerism, which it countered with its simple sweeping outline and a stark pose. Compare for instance this statue with the theatrical lines of Saint Theresa by Bernini (1598-1680) and the Santa Rosa de Lima by Melchiorre Caffa (1635-67). Very little is known of Maderno's life, even the location of his birth is disputed. One possibility is that he came from Capolago (an Italian speaking part of Switzerland). His brother was probably the sculptor and architect Carlo Maderno (1556-1629), who also came from the area. Thus it is likely that Stefano first learned the art of sculpture by assisting his uncle, who owned a workshop in Rome, as a marble cutter. His brother Carlo was soon decorating and designing his own commissions, and where Carlo went, Stefano tended to follow. Stefano began by copying antique sculptures and was soon casting highly regarded pieces of bronze sculpture. In addition, he was able to study the greatest examples of Italian Renaissance sculpture at first hand, including works by Donatello (1386-1466), Andrea del Verrocchio (1435-88) and the great Michelangelo (1475-1564). However, it was due to this unrivalled skill at copying sculptures from classical antiquity, that Maderno obtained (at the age of only 23) the papal commission that would ensure his place in the history of sculpture. The body of St Cecilia was discovered by Pope Paschal I (4th century) in the Catacomb of St. Callistus, and was moved to the Trastevere in Rome. There the body lay until the tomb was re-opened in 1599. The body was still intact and uncorrupted. Pope Clement VI summoned Maderno to the church to view the body before it was reburied, in order to make a reproduction. It is thought that Stefano's recumbent subsequent statue is an accurate likeness - he represents the delicate, small body lying face-downwards, with the knees drawn together and the head covered by a veil. The sculpture is so life-like that the viewer hardly needs to read the sculptor's testimony on the base. Stefano aims to directly engage the feeling of the viewer with this work of art, the body still looks warm while a mark on the neck indicates the axe blow that ended her young life. This method of engaging the viewer, and igniting emotions were to be perfected by Bernini and Caravaggio in years to come. 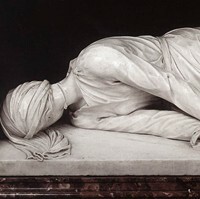 The sculpture of St Cecilia firmly established Maderno's reputation in his time and in 1607 he was elected to the Accademia di San Luca, the Academy of Fine Arts in Rome. In the process he became the leading sculptor of his generation in Rome, working on the dividing line between Mannerism and Baroque, and rivalled in his prime only by Camillo Mariani. Other important commissions he carried out include: the marble sculpture of Prudence for the tomb of Cardinal Alessandrino (Church of Santa Maria sopra Minerva, Rome); the large scale marble relief sculpture of Rudolf II attacking the Turks for the tomb of Pope Paul V (160815, Church of Santa Maria Maggiore); of less importance is the statue of St. Charles Borromeo in the church of S. Lorenzo in Damaso; the statue of St. Peter for the facade of the Palazzo del Quirinale in Rome; the decorative figures of putti in the Sistine Chapel of Santa Maria Maggiore; and the reclining figures of Peace and Justice for the altarpiece at the church of Santa Maria della Pace. One the few sculptures by Maderno outside of Italy is the small bronze statuette Hercules and Antaeus (162225, Cincinnati Museum of Art). In addition there are a number of terracotta works by Maderno in the Hermitage, St Petersburg, deriving from the Venetian collection of Abate Filippo Farsetti which sold them to Tsar Paul I and Tsar Alexander I of Russia 1800-05. The Hermitage terracottas include copies of Laocoon and His Sons, and the Farnese Hercules. To learn how to judge artists like the Italian Mannerist sculptor Stefano Maderno, see: How to Appreciate Sculpture. For later works, please see: How to Appreciate Modern Sculpture. In the 1630's, Count Gaspare Rivaldi, a regular patron, wanted to reward Stefano and so appointed him to a lucrative position in the tax office. Unfortunately, Stefano became so involved with his new job, he stopped working on his art altogether. He died in Rome in 1636. Maderno's lasting fame rests firmly on his St Cecilia statue, but his contemporary fame soon faded with the transition of Bernini's rising star.